Beeline (Mobitel LLC) is a world famous company working in Georgia since 2005. It provides GSM-communication services throughout the country. Beeline subscribers make up 15.4% of the Georgian mobile market more than 4 million people of the total number of users. The calling plans that provide free calls within the network. Low rates for local calls and SMS. Beeline offers 10 prepaid packages: "Simple", "Click," "Mix Mini", "Mix 7", "Mix 5", "Mix S", "the One-month International Mix", "Unlimited Beeline Network", "Unlimited for All Networks", and "The Tourist". The last three optimally fit For GSM termination. When you connect to the tariff plan "Unlimited Beeline Network" and "Unlimited for All Networks," the operator provides the ability to call within the network without restriction for 30 days, as well as the 1GB Internet when connected "Unlimited Beeline Network" and 2 GB for Unlimited for All Networks". However, license fees for these packages differ significantly. When connected to the "Unlimited Beeline Networks", you need to pay $1.85, and $ 7.41 for "Unlimited for All Networks". "Tourist" package is created by the operator for those who travel in the country. It costs $9.26. There are 50 minutes allocated for international calls, unlimited time for calls within the network for Georgia and SMS, including 3 GB internet. This tariff plan is popular not only with tourists but also smartphone users because of the possibility of cheap communication. However, it is designed just for 15 days but it's what the terminators need. Under these conditions, increased user activity on the network is unlikely to cause suspicion among antifraud systems. 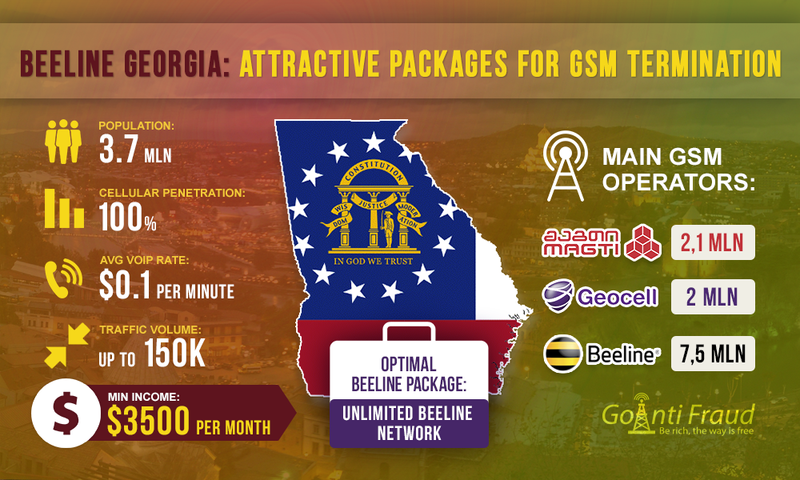 When you connect to the packages "Unlimited Beeline Network " and "Tourist", one minute of conversation will cost as little as $0.0018 and $0.0069 via "Unlimited for All Networks". The average rate inGeorgia is $0.10 per minute. When connected to the packages, a terminator's income will be about $0.099 per minute. When terminating via these packages the profit is about $1,000 per month from only one equipment channel. And when installing, for example, a GoIp 32 gateway, the above amount should be multiplied by the number of equipment ports. Judging by the reviews of experienced terminators, Beeline blocks SIM-cards in a lesser extent in cases of suspected fraud than other operators in Georgia. It has a loyal antifraud, which is another advantage for termination via Beeline cards when installing multi-channel Goip equipment in Georgia.